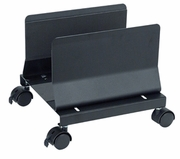 Get your bulky computer tower out of the way with the Aidata Black Metal Mobile CPU Stand. This sturdy metal computer tower stand is set on four casters that make the bulkiest of towers easy to move. Once in place, the two brakes keep it safely in one spot. The design is sleek and minimal, with a modern black finish. Adjusts to fit towers ranging from 5.25" to 8.6" in width. Easy to assemble. Sturdy metal made CPU holder, width adjustable from 132mm/5.25" to 220mm/8.6"